What to wear with Chelsea boots? I filmed a little video telling you what I got for Christmas this year and at one point I mentioned that I bought some new boots. Some of you asked what I got and the answer is a simple one. I got my 100th pair of Chelsea boots. Okay, that might a slight exaggeration but I basically live in Chelsea boots. In my eyes, they’re one of the most comfortable and versatile shoes out there. As I can’t wear heels and need something that gives my ankle stability, they’re the perfect choice for me. They are, however, not only popular with me. My dad loves them just as much and as we are very close in shoe sizes, we keep joking that we could actually swap shoes. 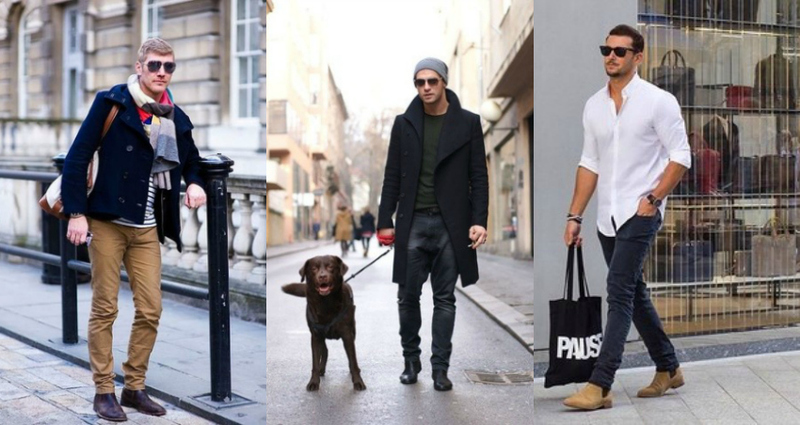 If you are a man who wants to know what to wear with Chelsea boots, lean back and relax. Chelsea boots are so versatile that you can wear them with just about anything in your wardrobe – just don’t touch your trackies or shorts. They’re super fuss-free, so definitely somewhat of a wardrobe staple – especially if you aren’t a lover of shoe shopping. 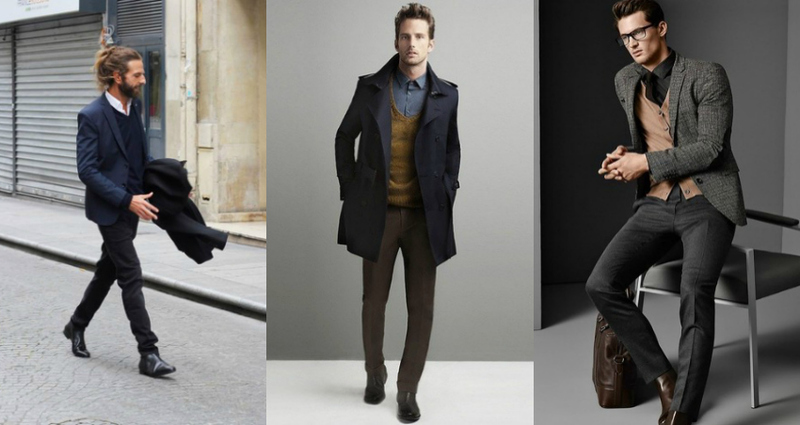 One of the most popular ways to style Chelsea boots is with a classic suit. No matter, if you pair a grey suit with a black pair of Chelsea boots to create a classic look or choose to combine a navy suit with a brown pair for a more casual look, you’re onto a winner. Teaming your Chelsea’s with jeans? 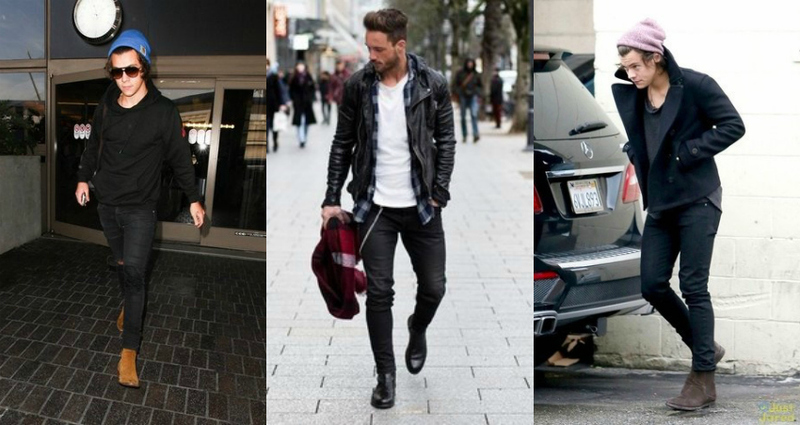 Go for skinny/fitted jeans, a casual band shirt and a leather jacket or sweater and wear the look that stars like Harry Styles or David Beckham rock oh so well. For a smart/casual look, pair a nice pair of jeans with a white shirt and jacket and don’t forget to let your jeans sit just over your boots. You’ve paid your hard-earned cash for them, don’t hide them. If you’re buying your very first pair of Chelsea boots, make sure to remember a couple of simple rules. Invest in a decent pair of boots for two simple reasons: a) you don’t want shoes that lose their shape or fall apart after a couple wears and b) you really need a decent sole. I’ve had Chelsea boots that I’ve paid £30 for and I’ve had pairs that I’ve paid £130 for and you really notice the difference. Not only in terms of comfort but also when it comes to longevity, especially of the soles. Chelsea boots should be snug, but they shouldn’t rub your feed and cause your pain or blisters. So make sure to get the right size for your feet. The elasticated fabric helps to keep your feet in place and it will not really get looser if you buy a good quality boot. Make sure to keep that in mind when shopping. Know your options! Chelsea boots are usually available in leather, suede or some sort of synthetic version. None of them is necessarily better or worse than the other but the perfect option for you depends very much on your needs. If you’re and outdoorsy person, a suede shoe is probably not for you. It’s difficult to clean and you’ll quite likely end up with soaking feet. Just experimenting with a new trend? Go with a cheaper synthetic option to see, if the style works for you before splurging on a real leather or suede shoe. I hope this post was helpful. Tell me in the comments, if you own Chelsea boots and how you wear them. I’d love to know!